FC Halifax Town remain perilously placed in the battle for National League survival after a 4-1 loss at Barrow, their heaviest defeat under manager Jim Harvey. The excellent Jordan Williams’ third goal in two games gave Barrow a deserved half-time lead, which was added to minutes after the break by Andy Cook and Jason Walker. Connor Hughes scored his second in two games before substitute Ben Tomlinson added some gloss to the score in added time. It remains a case of one step forward, one step back in the league for Halifax, who lost to Braintree after beating Grimsby and lost to Bromley after beating Southport. In the space of a single Easter Bank Holiday, they repeated that pattern; after their crucial win over Altrincham two days previously, they were brought back to earth with a bump after a disappointing display at Holker Street. There were mitigating circumstances, with Town playing with 10-men for nearly half the game on Saturday, and facing another match two days later. But the visitors didn’t help themselves with an underwhelming and uninspiring performance that boasted few redeeming features. The Shaymen are now one place and one point above the relegation zone, albeit with a game in hand, ahead of a tough trip to Dover. Town started with a patched up defence of Kevin Roberts, Hamza Bencherif and Scott McManus with Jake Hibbs and Sam Walker as wing-backs. The pitch at Holker Street wasn’t much better than The Shay on Saturday, with sand kicking up in and around the Town goalmouth; thankfully, like on Saturday, neither box saw much action early on. Town’s makeshift defence looked solid enough but there was no threat at the other end, with Richard Peniket a willing runner but looking isolated at times, with Shaquille McDonald and Hughes, rewarded with a start after his winner last time out, seeing precious little of the ball. Given the lack of entertainment and the sandy pitch, a bucket and spade would have been handy. But entertainment is a luxury in Town’s current predicament, and a goalless scoreline certainly counted as a successful return for their opening half-an-hour, despite their lack of threat in attack. There was no shortage of hard work from Harvey’s side, who funnelled back into position and closed down the hosts with zeal. But a lack of composure and creativity going forward meant they had failed to test keeper Joel Dixon by the time Barrow took the lead. Sam Johnson’s only save before then had come from a Jason Walker flick-on from a long free-kick. But the Town keeper could do little about Williams’ fierce drive across goal from Cook’s deft lay-off. The goal came when Sam Walker was off the pitch injured, and the fact he was replaced by Jordan Burrow was perhaps an indication of Harvey’s thoughts on his side’s performance up to that point. That change prompted a switch to 4-2-3-1 for Town, but still the visitors struggled to impose themselves on the contest, with Williams going close again with a deflected shot which Johnson kept out at his near post. Walker then should have punished Roberts after the defender misjudged the bounce of a long ball forward, but Johnson kept out the Barrow striker’s low shot, and with it, possibly kept Town in the game. Until three minutes after the interval anyway. 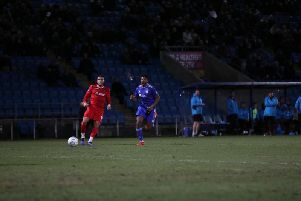 Andy Haworth’s cross was met with a bullet header at the far post by Cook for his 18th of the season, and it was now a long way back for The Shaymen. Their attempt at getting back into the game was a long time coming, with their first effort at goal not registered until Roberts headed wide from Josh Macdonald’s corner after 64 minutes. Dixon was then finally tested for the first time after 75 minutes when he tipped Nicky Wroe’s stinging shot over the bar, with Bencherif miscuing a shot when well-placed from the resulting corner. But Walker removed any doubts over the result when he blasted the ball across Johnson after Cook had won the ball back from a hesitant Town defence and played him through on goal. There was little consolation in Hughes’ late goal, with Tomlinson adding an even later one as he raced clear after a Halifax corner was cleared, and rounded Johnson before rolling the ball into an empty net. Barrow: Dixon, Sutton, Wilmer-Anderton, Livesey (S Williams 46), Grand, Harvey, Parry, Haworth, Walker, J Williams, Cook (Tomlinson 84). Subs not used: Abbott, Lacey, Pilkington. Halifax: Johnson, Hibbs, Roberts, Bencherif, McManus, Wroe, James, S McDonald (J Macdonald 55), Walker (Burrow 32), Hughes, Peniket (Fairhurst 68). Subs not used: Porter, Fazlic.